It's not just camshafts that can wear or fail—the camshaft bearings can have issues as well. Bearing failure can cause extensive damage to other engine components, so it's important to identify the root cause of issues and repair them as soon as possible. 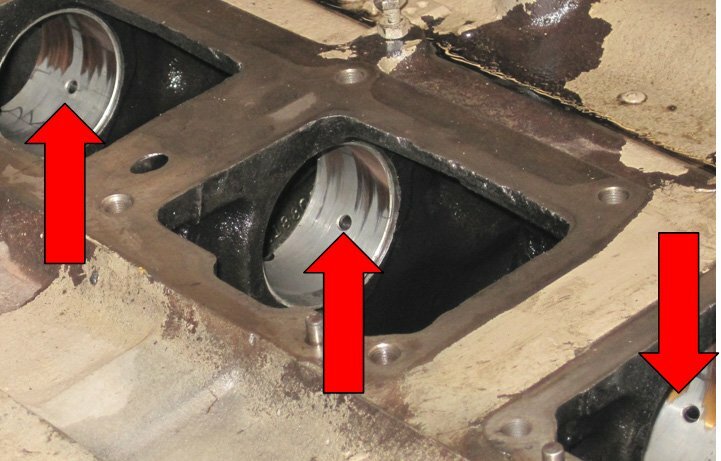 Below are some common camshaft bearing issues and possible causes to help you better identify what's going wrong in your engine. For proper function, bearings have to fit correctly, be aligned and be supported. When that is not achieved, you can have damage to the bearing journal. 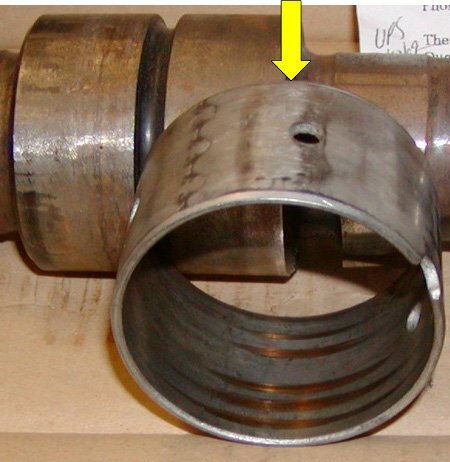 The below image shows a bearing whose measurements and wear marks indicate that the camshaft bearing bore in the block was probably oversized. The wear marks are uneven, indicating a likely distortion. There was probably too much clearance space, allowing the camshaft to move, hurting both lubrication and support. Not enough lubrication allows for increased friction, which increases heat. The camshaft can then damage the bearing surface as it rotates, which, after further use, may eventually lead to a broken cam cap. 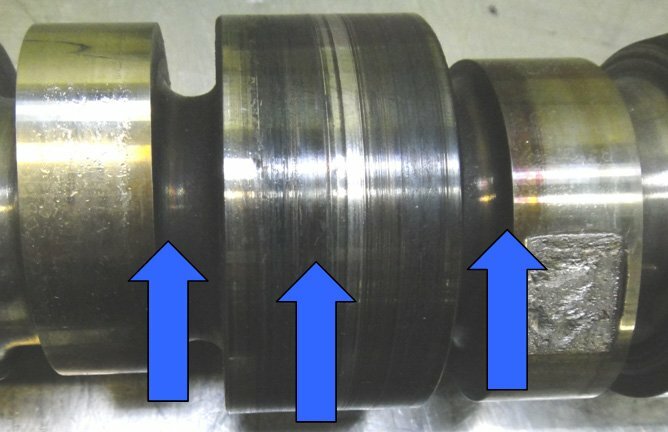 The image depicts the discoloration of a bearing journal because of poor lubrication. The blue arrow points to the extension of the issue onto the shaft. 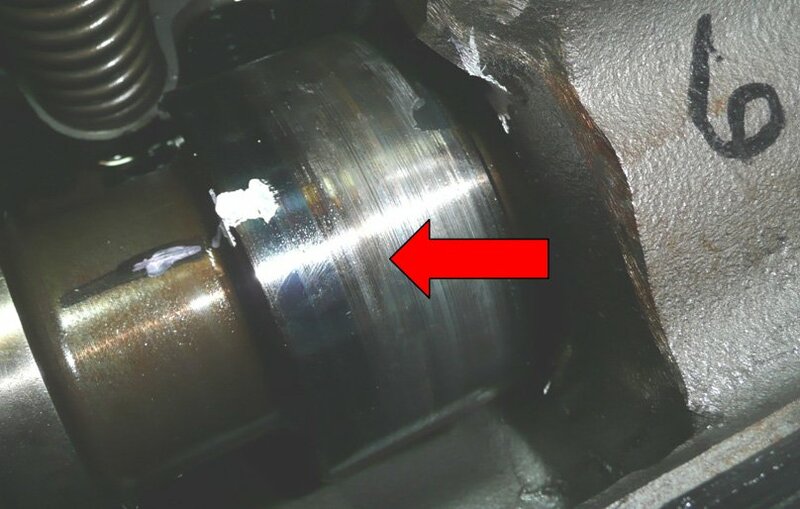 If your bearings aren't installed correctly, lubrication may be negatively impacted, which can lead to bearing failure, as shown in the below image. Note the partially covered oil hole in the second image. If the oil holes aren't aligned correctly on install, the oil cannot properly lubricate the camshaft, again leading to increased friction and wear on the bearings. The image shows the improper alignment of the bearings leading to partially blocked oil holes. Installing bearings the correct way can help prevent these problems—read our past blog, Camshaft Bearing Facts and Installation, for tips on properly installing your bearings. Too much wear can spell disaster for your camshaft bearings. Several things could be causing this, like improper install, incorrect bearing sizes, or elevated operating temperatures. Again, with these issues we'd see decreased lubrication, allowing for further damage to your bearings. If left long enough, you could experience total bearing failure. Writing for the July-September 2018 issue of Engine Professional, Brandon Flannery points out that your engine must be clean—the cleaner the better—before assembly. He finds that failed bearings are often caused by debris build-ups from poor cleaning—and blowing with compressed air might only make matters worse. Instead, rinse and wash them thoroughly to keep that debris from contaminating the oil that lubricates the camshaft and bearings. This dirt can either cause damage to the components' surface, or block clearance space, both of which could lead to failure. It's also important to pay attention to specific cam types as you're cleaning. The ISX Injector Camshafts, for example, are hollow, and sometimes debris collects inside the cam as it spins, like a centrifuge. We have seen times when the cam is removed, the jarring from setting the cam on the ground causes the debris to break free. 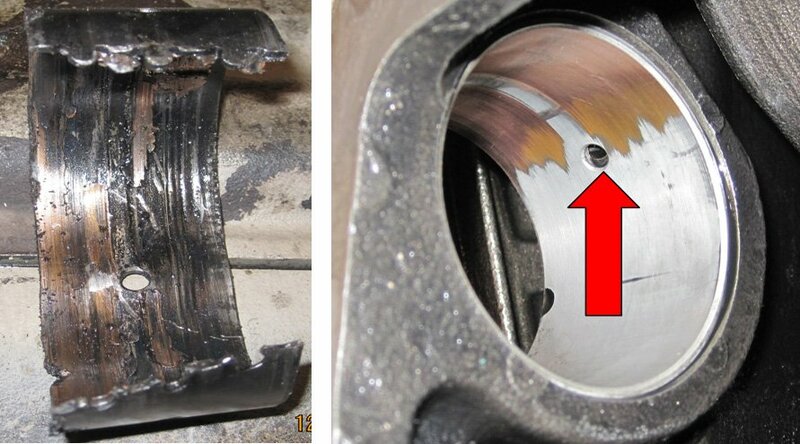 This debris can plug an oil hole, starving the bearing and ultimately failing the cam, bearing, and possibly the head. Damage to your bearings can cause a whole host of other issues for your engine. If you think you might be experiencing problems due to bearing damage, it might be a good idea to talk to your mechanic, or you can give us a call at 844-215-3406 to speak with one of our certified techs. You can also request a quote online for any of our parts.